1 of 1 Set rack in upper third of oven. 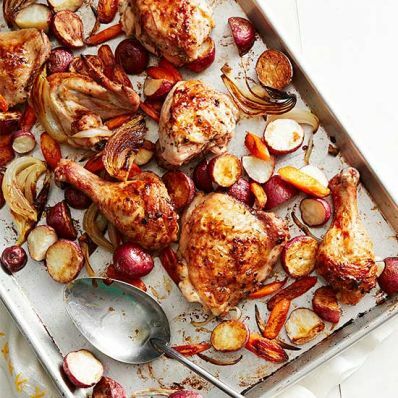 Place 1 1/2 lbs quartered small red potatoes, 3 large sliced carrots and 1 large onion, cut into thin wedges, on a large baking sheet and toss with 1 tbsp olive oil and 1/4 tsp each kosher salt and black pepper. Bake at 400 degrees for 30 minutes. In a large bowl, whisk 1/4 cup lemon juice, 2 tbsp olive oil, 1/2 tsp kosher salt, 1/4 tsp black pepper, 1 tbsp dried oregano and 5 cloves chopped garlic. Add one 4 to 4 1/2 lb chicken, cut into 8 pieces, to marinade. Remove vegetables from oven, stir with a spatula and arrange chicken among vegetables. Drizzle any remaining marinade over chicken. Bake 35 to 40 minutes, until vegetables are tender and chicken reaches 165 degrees . Per Serving: 530 kcal cal., 24 g Fat, total, 6 g sugar, 48 g pro., 316 mg sodium, 5 g fiber, 5 g sat. fat, 30 g carb.